Geniet van avonturen weg van Fairbanks terwijl je de prachtige landschappen van de wildernis van Alaska ontdekt. Loop langs de donderende Yukon-rivier en wandel boven de boomgrens van Finger Mountain voor prachtige uitzichten. 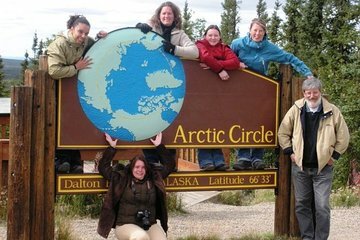 Neem op de poolcirkel een herdenkingsfoto en leer over de Trans-Alaska-pijpleiding, een van 's werelds grootste pijpleidingen. Geniet van livecommentaar en hotelvervoer tijdens deze volledige dagtour. Fascinating, fun trip with well-informed guide. A look into local lifestyle in a remote section of Alaska. Despite being a long ride, it was an awesome trip, because of our guide Randy, very informative, funny guy and informative. The scenery in the way was really beautiful. All the stops very memorable. Our guide Kaleb was very GREAT! Dom our tour driver did not stop at all the stops and there was no commentary - the scenery was fantastic and stunning well worth the drive just needed a better tour driver. Our guide Randy from 1st Alaska Tour was great ! He is very experienced in outdoor survival especially winter survival due to his prior experience in outdoor survival for the past 30 years not forgetting to add that he is a former US marine. During the trip, he gave us a lot of information on Alaska wildlife and share with us on his past encounters during his remote stay in the wilderness. He made numerous stops on the way to the Artic Circle for scenic views and photo shots, and on our way back we also manage to catch the beautiful sunset. I must say 1st Alaska Tour is a very good tour agency with experienced guides and strongly recommend using them for their professionalism. Great trip. Gary our tour guide had lots of interesting facts to share with us. Even though it was a long day well worth the time. Was a very interesting day. A lot of miles covered and Dave gave great commentary. Complete waste of 12-14 hours. Nothing to see and nothing to experience. Yes, one can claim that she/he was on the arctic circle. That's all. The road was brutal and 10 hours on non-paved road took a toll on us. Plan for a long day, but one filled with current facts, history, geographical information, panoramic views and stories of survival. The four in our party ranged from 12 to 69. Randy, our guide, provided us with an adventurous day. My wife and I did this trip yesterday and this has to rank among one of the most wonderful trips we have ever taken. We were a little bit perturbed at the length of this trip this being a road trip but the time just flew by. Our tour guide Kaloeb was just amazing, full of knowledge, full of information, ever ready to show us his knowledge of the area and surroundings. His passion showed through and he made this road trip a very enjoyable one. Highly recommended.